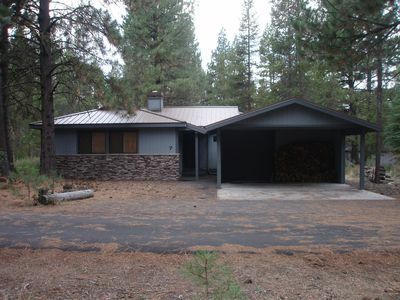 3500 sq ft. Across from the Village! Great for large groups! 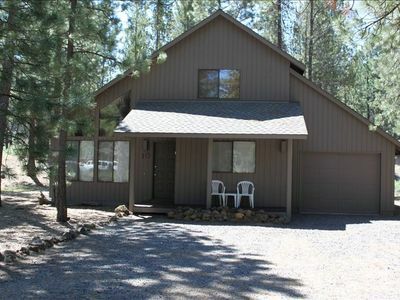 This family friendly, yet lovely house in the beautiful Sunriver Resort provides a vacation for small or large groups. You will fully enjoy your vacation with all the comforts of home coupled with the amenities of a first class resort! 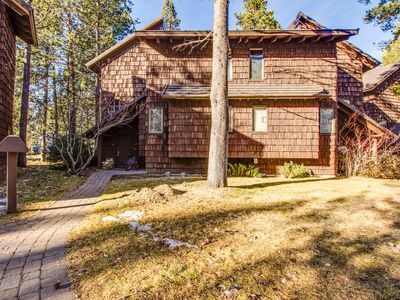 This large house is ideally situated within the resort- close to the Village Mall and also the main Resort Lodge. A short walk or ride to the new SHARC facility provides all the members of your group a day packed with fun! 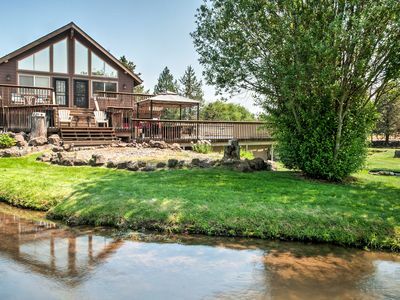 There are five bedrooms plus a game room, each individually decorated to reflect the surrounding landscape of forests and rivers, creating a comfortable and relaxing environment with all the modern conveniences that one could wish for. situated to accommodate all tastes. There is a new flat screen TV and huge comfortable sofas in the family room. A long banquet table in the dining room that seats up to 14 comfortably and is complimented by the full inventory of plates, glasses, and kitchen supplies specifically supplied for larger groups. The kitchen is well appointed with the latest appliances. Including many amenities that cater to a large group, including a griddle, blender, and crock pot. 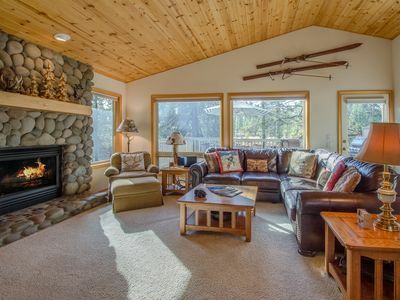 The kitchen opens into a cozy and spacious fireplace sitting room with a comfy, club like atmosphere. 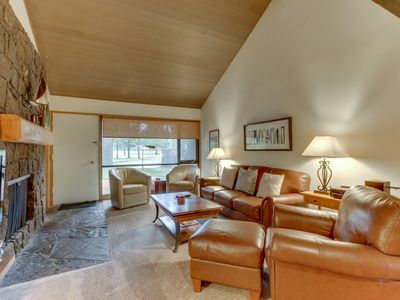 This room has a round dining table also - perfect for evenings by the fire and games or cards. 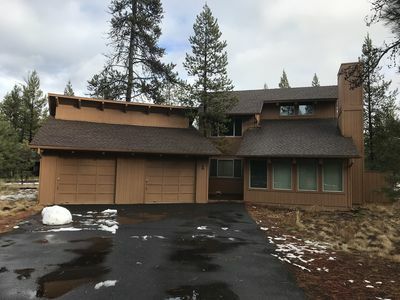 This area has a sliding door onto a redwood patio area complete with hot tub and ample room for dining in nice weather. An outdoor gas BBQ is another compliment to the high end kitchen appliances. 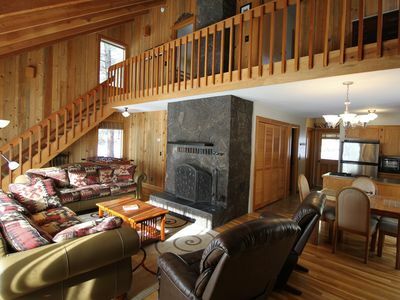 Upstairs are 3 bedrooms- each with Queen beds, and new flat screen TV's and the Master suite. The sumptuous feeling of the king sized bed with down comforters, new flat screen TV and access to the private deck all make this suite a favorite. 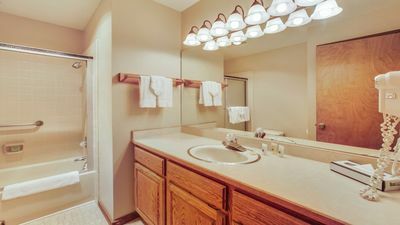 The master suite bath has double sinks and a jacuzzi bathtub. Designer bedding and decorator details make each bedroom unique. 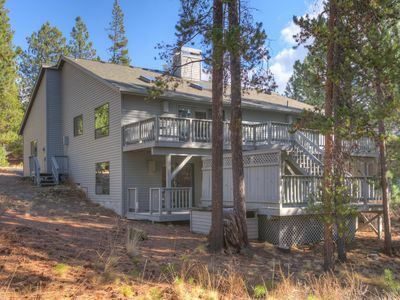 There is also a full basement with a spacious children's bedroom that has two sets of one-of-a-kind bunk beds made out of knotty pine and also has a queen sized bed. This 'dormitory' room is wonderful fun for the younger set and yet does not compromise on the snug and cozy feel of the entire house. 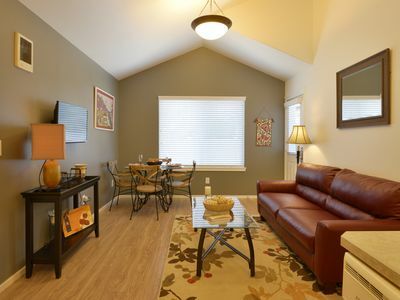 Also downstairs is a room with a large flat screen TV that is perfect for all members of the family! Football, games and puzzles are easily at hand. There is another knotty pine bunk bed in this room as well as a pullout sofa for more sleeping space! 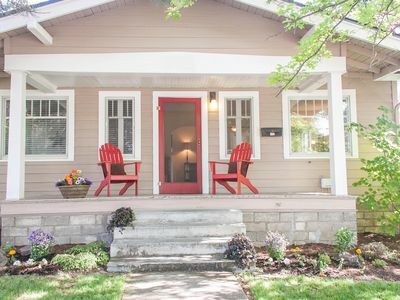 The house is located a few minutes walk or bike ride from the Village Mall where there is a supermarket, coffee shops, restaurants and specialty stores. 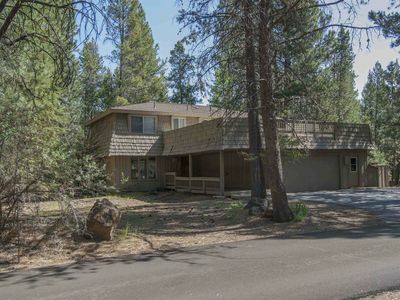 A short bike ride takes you to the luxurious spa, tennis courts, golf or the Sunriver Lodge. 35 miles of bike trails are waiting for you to explore! 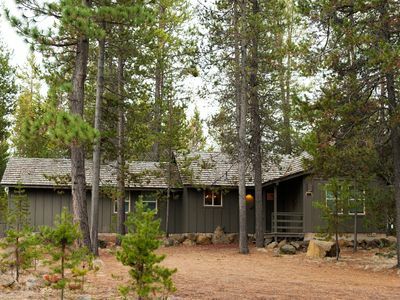 Charming Cabin Near Fort Rock Park and SHARC! Hot Tub! 8 SHARC passes included! 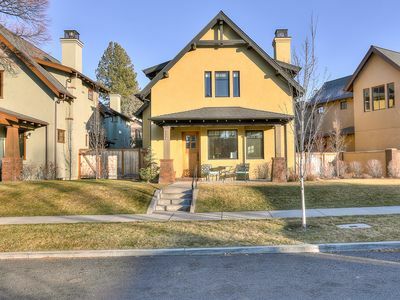 Bernhard Justice 2 bed +den Sleeps 6 Hot tub, 4 bikes-Historic walkable! Near the Meadows Golf Course & the Village, SHARC passes! 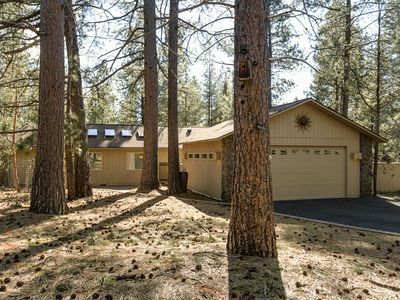 Peaceful Sunriver Home w/ Hot Tub, SHARC Passes, Fireplace, Wifi & Bikes!